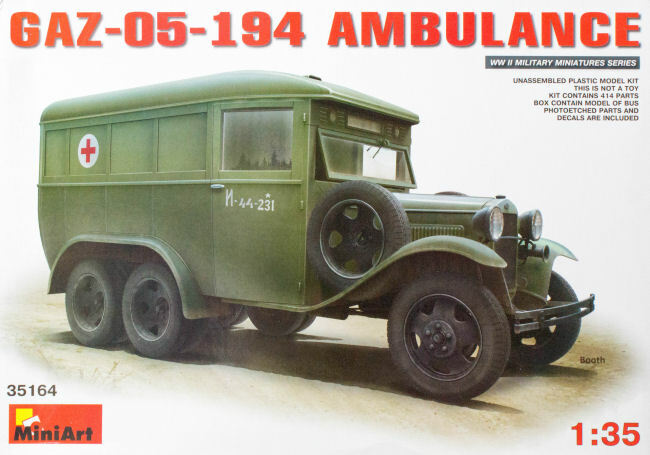 MiniArt is back with this interesting variant of the GAZ-AAA which uses the GAZ-03-30 body shell but with a bulkhead dividing the driver from the ambulance interior which is configured for several seated wounded and/or a single stretcher case. The kit is molded in light gray styrene and presented on 32 parts trees plus two trees of clear parts and one fret of photo-etched parts. Markings are provided for two ambulance busses in Soviet Army service circa 1941-42. Painting instructions are provided using MIG paint colors which are fine for those that use MIG paints. MiniArt used to provide painting instructions for many different paint brands and it would be nice to see MiniArt return to that solution for those modelers that do not have or do not use MIG paints.